There's been a major chill in the air and I'm loving it! My sweaters are finally getting worn instead of collecting dust in my closet. Thankfully, almost all of my knits are oversized and still fit me. 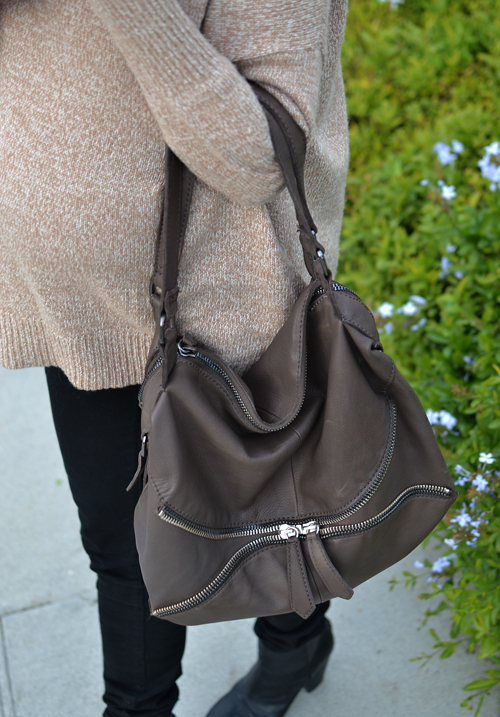 My Linea Pelle hobo is the perfect shade of gray meets taupe/brown and was the perfect accessory to go with my cozy, neutral look. I hope everyone is having a great week! Love the sweater and it looks perfect with the booties! Hope your enjoying your last few days of work before the holidays! you are just the most fabulous pregnant woman ever! that sweater fits you so well! Love your camel sweater... just bought two in this same shade. Stay warm lady, it's freaking freezing! this is such a pretty outfit. the sweater looks perfect! love this cozy outfit!! you look gorgeous! definitely the perfect neutral! LOVE that you kept it simple with the black bottoms and booties!! Perfect bag for a gorgeous soon-to-be mom! Love the cozy sweater but what I REALLY adore is that BAG! Hope you have the happiest of holidays and everything merry and bright!